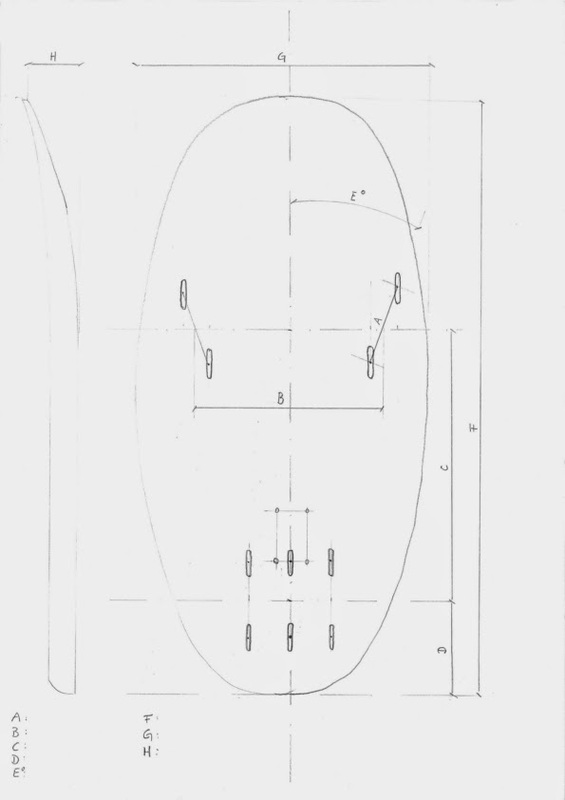 I'm planing on building a race - foilboard in polystyrene and epoxy to go with the Moses Vo-Race. At this stage I'd appreciate if someone could advice the overall length + width and the distances between the footstraps from your experiences. God luck and have fun building! The "B" distance you use in your sketch I measure a little bit different. 1.75" off of center is where I've been putting the inboard strap insert. Then ( "E" ) 45º and your next strap insert at 6.5"("A"). Regarding stance. Seems like 24-27" on the insides of peoples feet seem normal. I think your front strap positions are too wide, you don't need that kind of leverage as far as I can tell. Most boards seem to have the straps pretty central. I agree with footstrap comments above. And you don't need three footstrap positions in the back, you will only use the centre one. Yup get the straps on the center line. Thank for your feedback guys, expecially SpunMonkey. SpunMonkey I assume you mean from boardcenter to inner footstrap insert =1.75", correct? How much nose rocker would you guys reckon? Otherwise please don't take my rought hand scetch for granted. It's meant as an indication for the dimensions only, nor the outline or the front footstrap placement need to be like this. Florian Scharscher wrote: SpunMonkey I assume you mean from boardcenter to inner footstrap insert =1.75", correct? Seems to work for me. Cant finish a tack yet, though when I'm hanging from the kite in a duck tack attempt I can have both feet comfortably in the front straps with this separation. Also feels good upwind and reaching. ... My board has nose rocker11 cm . It is not much, since the thickness of the board 9cm. Good call on the 5 hole strap inserts! That will help a lot with tuning.